Roland Garros 2015. Everyone is talking about who’s the favourite this year, about whether it’s the end of the reign of Rafael Nadal. The obvious favourites are Djokovic, Murray, Federer…and Nadal. Nadal has won nine French Open since 2005. That was ten-TEN-years ago. He’s still one of the favourites although his form in the last few months has been near disastrous for his standards. Nadal is today anything but a young gun. Djokovic and Murray, once upon a time (in 2007) were the young guns although they are just a year younger than Nadal. It’s the first French Open where, on paper, based on the last four months, they stand a higher chance to win the French Open than Roger and Rafa. But how about the young people? The proper young people (under 25)? Nishikori comes at the top of the list. Back in 2011, he was one of the rising young stars.But today, at 25, he’s all but a beginner. Nishikori is brilliant on clay and has been progressing sharply since his association with Michael Chang. But he hasn’t won a grand slam yet, whereas at this age, Nadal had already won 10 grand slams, Federer 9 grand slams, Djokovic 5 grand slams. Nishikori is on Federer’s half of the draw (avoiding a possible early clash with Nadal/Djokovic/Murray). Is this his best chance of winning the F.O ? Dimitrov. Three years ago, he became a star, called Baby Federer, notably after he beat Djokovic in the Madrid Masters. Today, at 24, he’s anything but a baby in tennis terms. He has yet to reach a grand slam final. He was very close to beating Djokovic in last year’s Wimbledon but lacked the killer instinct at key times. The killer instinct that makes great players. Will he ever have it? Raonic. Is a big server. He moves well for his height. But tall people tend to get injured in tennis . Don’t get me wrong. Del Potro? Marin Cilic? Karlovic? All these people have suffered from injuries during their careers. And Raonic is no exception as he withdrew from the French Open because of a toe injury. Also, tall players are usually not exceptional clay players. Their serve is not as lethal as on hard court and their movement is not as good as a young Nadal or Djokovic, which is key on a slow surface such as clay. Kyrgios: What differs Kyrgios from other young tennis players is he’s already beaten Nadal in a grand slam. That was Wimbledon though, not clay. But you have to beat Nadal in a grand slam. Beating him at the age of 19 will give him a lot of confidence and hope that he can beat anyone. It is very important to get these huge wins at an early stage in your career. Nadal himself beat Federer in Miami in the first encounter, that was when he was 17. And Federer beat Sampras in Wimbledon when he was 20. However, Kyrgios is not a clay court specialist. He’s tall-again-massive serve. Moves well for his height but is not Ferrer. He might cause a lot of problems for anyone meeting him in the F.O. But I would expect him to do better in Wimbledon. Dominic Thiem: Thiem is probably one of the better clay players of his generation. He can move very well, is a very complete player. Only issue. He has a single handed backhand. At a time where the strategy is clear to beat a single handed backhand player (play high bouncing balls on his backhand), he might face a few problems if he faces a Nadal or a Murray at the French. He also has to work on his physical stamina to win great five setters in grand slams. Coric impressed me when I first saw him playing. He has already beaten, at the age of 18, two members of the old big 4, Nadal and Murray. But that was on hard court – and not in a Grand Slam. Next step is to get a big win in a grand slam. I didn’t see him shine on clay yet. Hard court seems to be his best surface. He might have to work hard this French Open to prove us wrong. He would possibly have to beat Nadal to reach the second week. 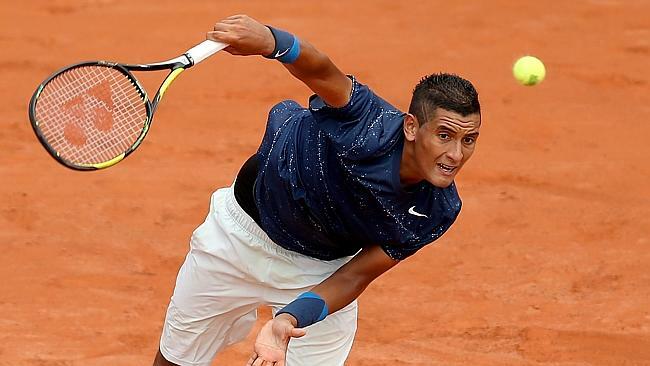 New young guns seem to be too tender yet to shine on clay and win the French Open. But they have the freshness that the old ones are starting to lack. And maybe the insolent explosion of youth? We have yet to see it in the French Open. Among the not so young guns, it’s Nishikori’s best chance to date. He’s got to do it. If he wants to be a multi-grand slam winner one day. Only the next two weeks will tell us if the youngsters will finally make a breakthrough in the most challenging Grand Slam of the year. Or whether the old Four will stay here to dominate one of the golden eras of tennis. ← Who the hell is Oscar?